Taking inspiration from Mark Osbaldeston’s Unbuilt Toronto books, the Peel Archives is currently showcasing records documenting never-realized planning and building initiatives within the Peel area. The exhibition, now open in the Archives’ Reading Room, reveals a wide range of fascinating possibilities of what could have been. Unbuilt Peel allows visitors to let their imaginations soar, contemplating “alternative universes” where different municipalities, buildings, and public transportation options exist. 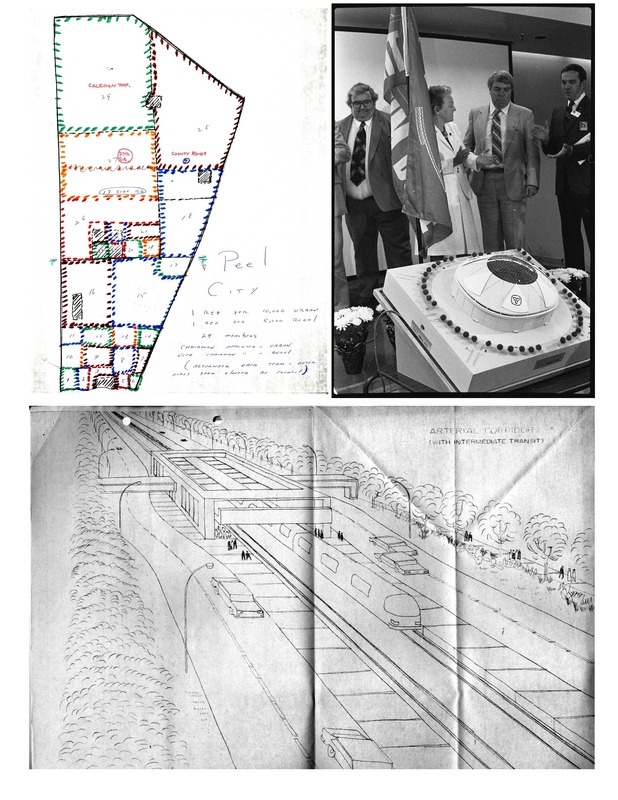 Clockwise from top left: Proposal for an amalgamated City of Peel, officials unveiling a model of the proposed “Trillium Dome,” and an artistic depiction of a proposed light rail transit system. These and other never-realized ideas are reconstructed from a range of records in the Archives at PAMA, including Planning Department/Board reports, council minutes, Clerk’s office correspondence, newspapers, site plans, and photographs of architectural models. This exhibition reveals the untapped potential of the records in our care – researchers may not know about our rich government holdings, including Planning board reports and council and committee records. These records often offer fascinating insights into the hopes and dreams of area residents. As an archives we not only document worlds that were, but also worlds that could have been. I also want to thank Archives Assistant Kristen Young and our team of volunteers for their additional research support. ← Immigrant voices in archival records: The Cumbrian Connection, final post. Thanks Chris! We too were struck by how different things could have been if even fairly minor decisions had gone differently. The world we take for granted is one of many realities that could have been! As someone who enjoys alternate history science fiction, and in general has always mused about ‘what-might-have-beens’, I have enjoyed your Unbuilt Peel exhibition at the Archives, and have appreciated the even more in-depth exhibit stored at Google. Thanks! That’s great to hear, Will! Archival planning records really make us think about how many contingencies go into making the world we take for granted, and how easily things could have been so different.